Indian virgin unprocessed CEOGirl(SM) business class human hair single bundles. Colors also available- make a selection from the drop down box. Exclusively available on RemyHairSales.com. Indian virgin 100% real unprocessed human hair sales grade 8A. 4 ounces per bundle 14-30". Bulk and weft- all hair is dyeable. Client has 3 bundles of 16" installed for this style. Buy 2 bundles per set virgin indian hair sales, colors available also please use drop down box and select. 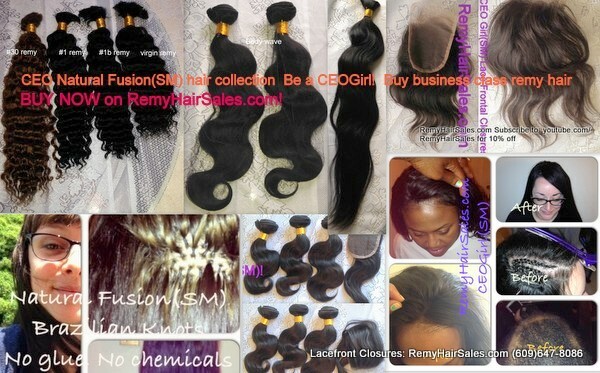 All CEOGirl(sm) hair is available in curly, body wave, natural straight, and if course natural wave deals and steals.